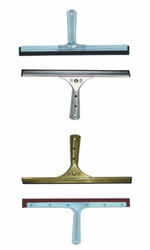 Window squeegees make cleaning any window quick and easy. You can use them with soap and water or glass cleaner; either way you will be able to have a sparkling clean window in half the time it would take with a cloth. Home: Nothing brings a home down more than drab dirty windows. These little devices allow you to put a sparkle back in your home with shiny clean windows. They make this chore fast and simple. Car: Window squeegees are a must for your car or truck. They will help you keep your windshield bright and clean. This makes driving safer, as you will not have any impaired vision due to a dirty windshield. They can also help you clean dirt and snow off the car. Business: You can keep your windows clean and bright at your business with these little devices. They are cheap to purchase, and window squeegees can really make a difference. Clean, sparkling windows puts customers in a good mood when they enter your business. Plus, it looks professional and inviting when everything including the windows is clean. When potential customers walk into your business they will feel good when they see everything looking clean and nice. This will encourage them to do business with you. First impressions: Windows are the first thing people see when they ride in your car, or come to your business or home. If you use window squeegees to clean them, it reflects well on you. Two-ply rubber: These wipers range in size from 6 inches to 18 inches wide. This allows you to use them for small narrow spaces or big areas of glass. The blades are soft, allowing a gentle touch to avoid scratches and damage to the glass. Refills are available for the blades. Black rubber: This model comes with an extension rod that you can easily snap on when you need to get to hard to reach places. Window squeegees like this can be used for long and wide areas of glass. Their blades range from 10 inches to 18 inches. The frame is made of brass. Neoprene and vinyl: These are very strong devices; you can apply grout to tiles with them; they are heavy-duty and durable. The blades are 6 inches to 24 inches. Hand held:?? These types of wipers are strong and easy to clean. You can use them for applying wallpaper and for floor use. These window squeegees are easy to use and are open ended so that they are more hygienic. The length of the blades range from 6 inches to 18 inches. These products are environmentally friendly. The rubber is 100% recyclable so that there is no waste when blades need to be replaced. The metal and plastic handles of these devices are made to last a long time which decreases the need to throw away these materials.?? These window squeegees will not only help you with jobs, but you can also rest assured that you are helping the environment by using these types of products. Read about different car wash equipment and their functions.